Mara's Café & Bakery is a winning concept, combining all the key elements of a café, including a relaxing atmosphere and fresh brewed coffee, along with the fresh baked goods of a fine bakery. We also have a full menu that features everything from sandwiches, quiches, soups and salads to pizzas, sliders and even a kids' menu full of delicious dishes. Whether our customers want breakfast, lunch, dinner or dessert, we offer something for everyone, for every time of day. Mara's Café & Bakery was voted Best Coffeehouse in New Jersey. We offer customers fresh brewed coffee roasted on site daily in our state of the art equipment. Mara's has won numerous awards for its dessert offerings, including Best Cheesecake in New Jersey. No other restaurant, café or bakery offers quite the variety, quality and ambiance that can be found at a Mara's Café & Bakery. What do I get when I join the Mara's Café & Bakery franchise system? Franchise owners and their key management staff will receive at least two weeks and up to three weeks of training, including both classroom and on-the-job training. Your team will also receive five days of onsite help at your own location around the time of your grand opening. You will have access to all Mara's Café & Bakery trademarks, recipes and supply chains, and our unique operational procedures. And, we'll provide you with a copy of our confidential operations manual to help you run your café properly. We are seeking motivated owner-operators with solid restaurant operating experience to join our system. In exchange, we will provide the tools and training you need to run your own Mara's Café & Bakery location. We do, of course, also expect that you have the right amount of capital to invest in the franchise. Start-Up Assistance: Our team will assist you in site selection, and our complete store design and set-up process will have your business operating as quickly and efficiently as possible. Supplier Assistance: You will receive access to our proprietary food product lines and key suppliers. Marketing Assistance: With the help of our experienced promotional team, Mara's Café & Bakery could soon be the hottest new location in your community. The franchise fee for a single-unit franchise is $25,000. This fee funds our pre-opening support of your operations; including site selection assistance, initial training, and onsite help. The estimated required investment for a single franchise unit ranges between $345,750 - $446,000. As with any new business venture, it's important that you have the capital needed to adequately fund your new business. The initial term of your franchise agreement is ten years, with two subsequent successor terms of five years each. What ongoing fees are paid to Mara's Systems, LLC? Franchisees will be required to pay royalties of 5% of gross revenues. These fees allow us to fund our ongoing support services and the continued development of recipes/products, procedures, marketing tools, training programs, and systems upgrades. Mara's Systems, LLC will require that franchisees spend a minimum of 2% of revenues on local marketing. Franchisees will also be expected to contribute 1% of gross revenues into the system marketing fund. All collected funds are used to develop marketing strategies to promote the Mara's Café & Bakery brand and fund the creative costs to develop local franchise marketing materials. 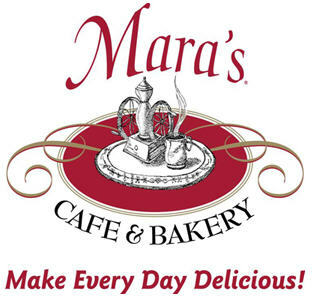 Get ready for a fulfilling and rewarding career as a Mara's Café & Bakery franchise owner and start planning for a future that can only be described as deliciously amazing! With our family-friendly concept and established business model, you can become part of this incredible franchise program. But that's just the icing on the cake! Thanks to our team of business and foodservice experts, customized tools and support and our well-established reputation for simply being the best – the prep work has already been done for you. Take the final step and create a life that is both sweet and satisfying by becoming a Mara's Café & Bakery franchise owner today!